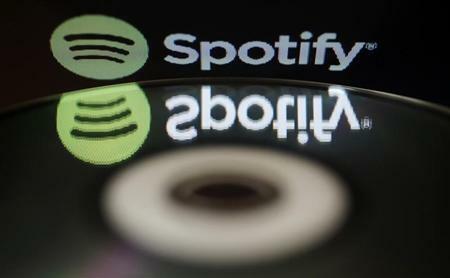 NEW YORK (Reuters) - Spotify announced on Tuesday its first partnership with a mobile carrier in an effort to boost subscriptions and get more people to listen to its online streaming music service. The deal with Sprint means that starting on May 2, Sprint's customers will receive a free trial of Spotify. Sprint subscribers on its tiered "family plan" will get discounts to Spotify subscriptions once the trial period ends. "This is this is the biggest deal we've ever made," said Daniel Ek, chief executive of Spotify, referring to the number of consumers the partnership will reach and the level of marketing dollars put behind the partnership. He spoke at an event in New York announcing the deal. People can tune-in to Spotify for free but they have to listen to ads. The company offers to listeners a premium subscription service without ads for $9.99 per month. Spotify is a popular music service but it has a way to go to get more people to use it. It has amassed more than 24 million active users worldwide using very little marketing. Its rival Pandora has more than 75 million active users across the world. The deal with Sprint may help Spotify - which normally eschews advertising - spread the word about its service. Ek said in an interview with Reuters that Sprint will handle the marketing but he declined to offer more details. Beats Music, another online streaming music service, struck a similar agreement with AT&T. "Mainstream America doesn't know what Spotify is," Ek told Reuters who said he hopes Spotify can get to 100 million active users worldwide by the end of this year. "Given Sprint's national footprint, it will bring awareness of Spotify especially in middle America to a new high." Ek said he doesn't have plans for a public debut.